Use TB1A7F6 to reference this item. To raise awareness of motorcycles that share the roads with other vehicles and the safety of riding. 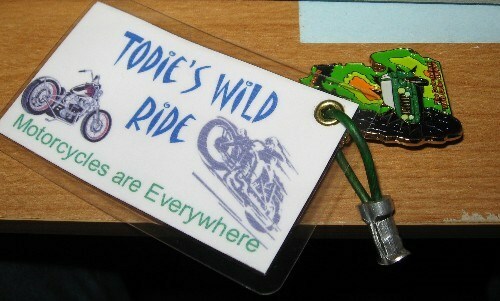 This geocoin is dedicated in honor of Tod Phillips, geocacher & motorcycle rider. If you find this coin, please take a moment to think about how you drive and ride. Always keep in mind that there are others on the road and that your actions can affect them, and their loved ones, forever. Pay attention to bikes, give them some room, and be patient so that we can all arrive safetly at our destinations. Always be on the look out. Double check your blind spots. Remember: MOTORCYCLES ARE EVERYWHERE! Picked up today, will move along soon.